Parenthood comes with many challenges; there’s no doubt about that. 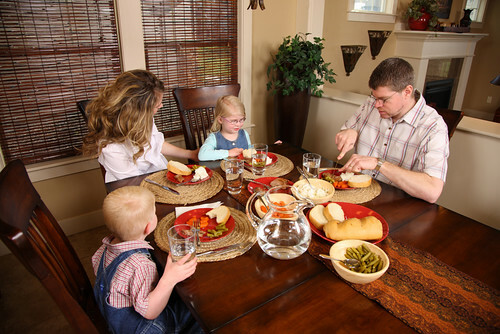 Of course, one of the most challenging parts of being a parent has to be family mealtimes. Between school pickups, sports practices, and work, it can be a real struggle to get a healthy meal on the table each night. It’s not only time that can be an issue either, lots of kids have different tastes and go through stages of being fussy about what they will and will not eat. Making mealtimes even more complex. As a parent, you want to ensure that your children eat well, and get a wholesome meal each night. The problem is that sometimes it can seem almost impossible to put together a healthy meal that everyone in the household will eat. As a mom, I can relate to this and know the struggle all too well. There’s nothing more frustrating than struggling to find the time to cook dinner, only for your children to refuse to eat it. One of the best and easiest things you can do to make weeknight meal times easier is plan them in advance. It might seem somewhat daunting to plan a whole week’s meals in advance, but trust me on this, it will make your life so much easier. It’s just a case of getting into a routine. It’s a good idea to set aside an hour or so one day a week to plan your meals for the following seven days or so. That way you can commit fully to it and think about what the best dishes to serve are, as well as what you will need for them. It pays to make a shopping list at the same time as you are planning your meals so that you don’t end up forgetting anything important. By planning your meals in advance, you will also find that it’s much easier to keep family food costs low. When it comes to planning family meals for the week, one thing that you don’t want to forget is to take your weekly routine into account. Take the time to look at yours’ and your family’s schedules to see what nights are going to be the most hectic. For those nights, plan a meal that’s quick and easy to make, or use your slow cooker and prepare dinner in the morning. For those nights when it’s crazy, leftovers can be a godsend. I tend to freeze all my leftovers and then defrost them as and when I need them for quick meals. Look at your schedule and determine whether there are any nights where everyone needs to eat at different times due to clubs and activities. For these nights, a slow cooker meal really is your best option. By taking your schedule into account when meal planning, you can make it much easier for yourself. If your kitchen doesn’t have all the necessary equipment, you will find making family meals even more difficult. The chances are you already have the basics - pots, pans, serving spoons, etc., but what are you lacking? If you don’t have a slow cooker, I suggest that you get one. For those days when you know you’re not going to have time to cook when you get home, a slow cooker can be a godsend. You just pop the ingredients in it in the morning, set to low, and that’s dinner sorted - by the time you come home it should be perfectly cooked. Or, how about investing in cast iron skillets instead? You can use these to cook on the hob and then place the meal into the oven to bake or simply keep warm. This means that if dinner’s ready a little earlier than you would like, it’s much easier to keep it warm while you wait for everyone to get home. What about a food processor - do you have one of these? If not, they’re more than worth the investment, as they make preparing food much quicker and easier. By having the right equipment on hand, cooking meals becomes a whole lot easier. Hold a family meeting and ask everyone what meals they like and which they don’t like. Give everyone a sheet of paper and a pen and get them to write down the meals that they enjoy and the ones that they don’t like. Then, you can use their answers to delve a little deeper into why certain people don’t like a dish. Let’s say one of your kids says that they don’t like spaghetti and meatballs; you can then ask them why. The chances are it’s a trivial thing, like the fact the sauce has chopped mushroom in it, for instance. The good news is this is something that’s easy to change. Use the answers that you get to write a list of meals that everyone in the household likes - this will make meal planning a little easier for you. A great way to make weeknight meals more interesting is by having themed nights. So, for instance, Tuesdays could become 'Taco Tuesday', meaning that every Tuesday, you serve tacos for tea. Or, Mondays could become 'Meatball Monday' - you get the idea. By having themed nights throughout the week, you can make mealtimes more fun and enjoyable for your little ones. The great thing about this is that what you serve can still be healthy and homemade, your kids just don’t realize it, that’s all. You can even make pizza - a family favorite - healthy by making it yourself. To encourage your children to be open to new foods, one night a week try something new. This should ideally be on a night when there’s no rush to eat, and you have time to sit down as a family and enjoy a meal. Perhaps each week you could allow one of your kids to pick a new dish to try? This could be a dish that they’ve tried at a friend’s house and loved or something out of a recipe book, either way; it doesn’t matter. Just make sure that any dishes that you make, don’t include things that anyone in the household doesn’t like. At first, your little ones may not be keen to try new dishes, but once they realize that they get to pick them, they’ll soon get into the swing of it. Family meal times can be one of the hardest parts of parenthood to navigate, especially when everyone has different tastes. The important thing is not to get stressed out, and to make time for weekly meal planning and preparation. As by doing this, you can make weeknights much less stressful for everyone. If your child doesn’t like something, take it into account. If you don’t, you’ll only end up with more problems. The chances are they’ll grow out of fussy eating, but to make mealtimes easier for now, listen to their likes and dislikes. It will make family life a whole lot easier.